G&A Roof Window and Skylight Installers are a leading roofing firm that provides specialist roof window fitting for property owners in the City of London. G&A Velux Skylight Fitters City of London have been supplying and fitting quality roof windows and skylights for many years. Our roofers are skilled roof window and skylight fitters and have a reputation for providing superior workmanship and excellent customer care throghout the City Of London. G&A has been established for over 25 years. We are members of the Confederation of Roofing Contractors, a leading trade body. Before we start any work, we will undertake a risk assessment, ensuring that your property is safe. Roof windows and skylights can bring extra space and light to your attic or loft, transforming the area into a liveable, light space that can be used as an extra room rather than simply a storage area. We can usually fit skylights quickly and safely without the need for scaffolding. 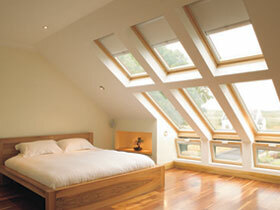 We would be happy to discuss all aspects of your loft conversion with you. Call G&A City Of London for advice today on 020 7205 5785. We also offer painting, decorating and plastering services. Find out how our Velux skylight installers can help you look after your property. Contact our friendly team in the City Of London for advice or an estimate today on 020 7205 5785.